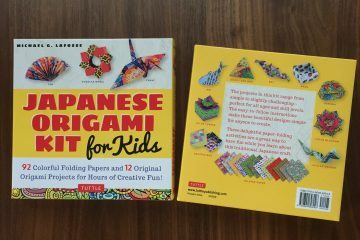 When I first received the Hokusai and Hiroshige print origami paper packs from Tuttle Publishing, I was just too afraid to fold these beautiful arts. I didn’t want to ruin some of Japan’s finest arts in history by folding! I just wanted to keep and admire them, without folding. But then I started seeing it as a fun challenging opportunity that will help my creativity flourish. And well… I needed to review the products for Tuttle! 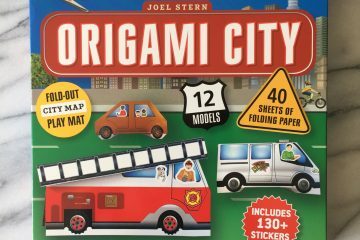 With some help from my origami friends, and inspired by some of the world’s foremost origami artists, I came up with several fun ideas. Here are some things I folded (in order of me folding). Note: if you follow me on Instagram, you may have already seen most of these photos/video clips below. You could skip to the bottom of this post that’s more of a review of this product, which maybe more helpful. The model below, called Bird Dish, is designed by Jonathan Miller and was taught by Kayo Kurata at the Origami Tanteidan Convention 2014. It is based on a traditional paper crane but each wing is like a pocket that can hold little trinkets. I used a Hiroshige print paper with cherry blossoms. Traditional mass box displaying three geisha ladies by Hokusai. “The Plum by Garden in Kameido” by Hiroshige, turned into a kimono. The kimono model’s designer is Makoto Yamaguchi. The next three things that I folded are the type of models that flash open and close. I took short video clips for these models. The first video clip, below is a model called Origami Flasher, which was designed by Jeremy Shafer and Chris Palmer. (The instructional video of this model by Mr. Shafer can be found on Youtube: HERE.) I thought this would be a fun way to present Hokusai’s most recognized print of Red Fuji. The second video clip was of something I folded while experimenting with different kinds of corrugating “V” shapes. I used another Hokusai print with Mt. Fuji. I love the crease pattern of this symmetrical model. Last but not least, the third video is of “Miura-fold.” In case you are not familiar with Miura ori, it is a folding method developed by a Japanese astrophysicist Koryo Miura. In this method, a flat surface such as a small sheet of paper is folded into a small area, with repeating crease patterns of parallelograms. Miura-fold is applied for various uses throughout the world, including maps and solar panel arrays. The photo below is an one-minute Kawasaki Rose, which took me about 30 times more than it should have. I used Hiroshige’s landscape print with a variety of colors and some texture of waterscape. This is the only model I folded that isn’t showing much of the print, but I like the way it came out. Another origami kimono, from another Hiroshige’s print of a beautiful scenery. The idea of folding the shape below came to me when I was folding some ornaments. This generic crease pattern, which starts with the traditional lily base, is geometric and versatile, I love it. I thought that exhibiting this Hiroshige scenery print with this pattern makes it look like a perspective of a special lens. 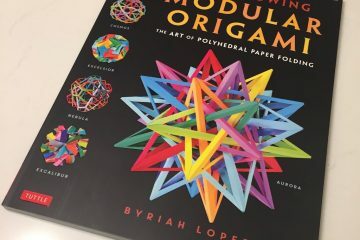 I could easily keep folding more out of these paper and share more photos, but the main purpose of this post was to review this product, rather than to exhibit what I’ve folded. So I better give you more info that would be helpful, in case you are interested in these products. Hokusai Prints Origami Paper come in the size of 8 1/4″ and 48 sheets. 8 different ukiyo-e prints by Hokusai, including Tsunami and Red Fuji. Hiroshige Prints Origami Paper comes in the size of 6 3/4 and 48 sheets. 8 different ukiy-e prints of Hiroshige’s landscapes and sceneries. The back side of the paper is solid color that is complementary to the art printed front side. The paper is thin like a full-color magazine page, but not too glossy or matte. It’s something in between. It folds without ripping or fading on creases very easily. Each pack comes with an instructional booklet, but they are not models inspired by the types of prints included. The booklet is just a generic one that comes with all of Tuttle’s origami packs. Overall, I am extremely pleased with these products. I grew to love them, even thought I was a little intimidated by what they are at first. As Japanese and and as an artist I inevitably wanted to pay respect to some of the greatest Japanese artists, Hokusai and Hiroshige. But I am glad that I found many uses of these prints that bring out the beauties in them. I see on Tuttle website that there are also other types of old Japanese art print origami paper, including: Geisha, Samurai, and Floating World, all of each come in two different sizes. Those sound really cool too!